Superior UV protection for your home. With the sleek horizontal blades of a shutter and the versatility of a Roller Blind, Tricoshade Blinds are the perfect solution for your window coverings. Tricoshade Blinds are pleated and provide superior UV protection. To direct the sunlight away and also adjust the amount of light passing through, simply adjust the angles of the horizontal vanes. 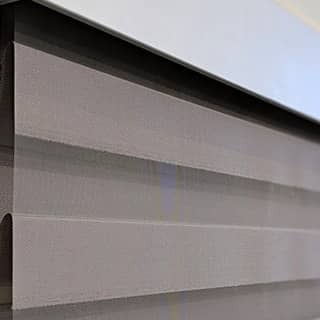 The unique three-cell design of these particular blinds provides maximum insulation, ensuring that your home or office is energy efficient. The alternate sheer and dim-out panels allow for three very different looks and functions in one single window dressing. Apart from a heavy lined curtain, dim-out blinds are the most effective way of blocking out daylight. In commercial situations they are primarily used for functional reasons where room darkening is a requirement. In the home, they are great for bedrooms or living areas, to minimise on-screen glare and allow for a great night sleep. Tricoshade Blinds provides you with complete control of light, privacy and view in a compact roller design system. Functionality aside, these blinds are also available in three classic colours. Tricoshade Blinds are not just stylish, they are also a functional blind. These blinds are easy to use, maintain and keep clean. To operate, simply pull on the child-safe chain to roll the fabric up or down the window. Or, you can opt for motorised roller blinds and roll them up or down with the simple push of a button. Motorised blinds are the perfect solution for high windows that are difficult to reach, ensuring that you still have complete control over light and privacy. Interested in Tricoshade Blinds? 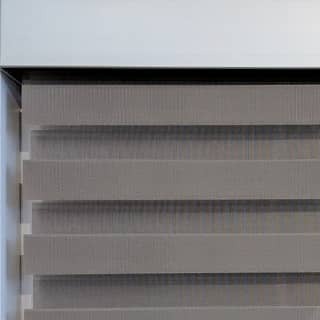 These blinds are available with ABC’s intelligent home motorisation system: SmartHome. This innovative device connects to your home WiFi, allowing you complete control of your window treatments using just your voice or your smartphone.